This La Liga season has been bonkers already: Cristiano Ronaldo is scoring everything, Barcelona have yet to concede a goal, and Eibar looks like the most impressive Basque club in the league. So what did we learn this week? Plenty. Valencia 3 – Atletico Madrid 1: In our preview, we said that this game was a statement game for Valencia. With a new owner, new manager and a host of new faces, Valencia can make a statement against the league leaders and show that there is a top 4 in places other than England. 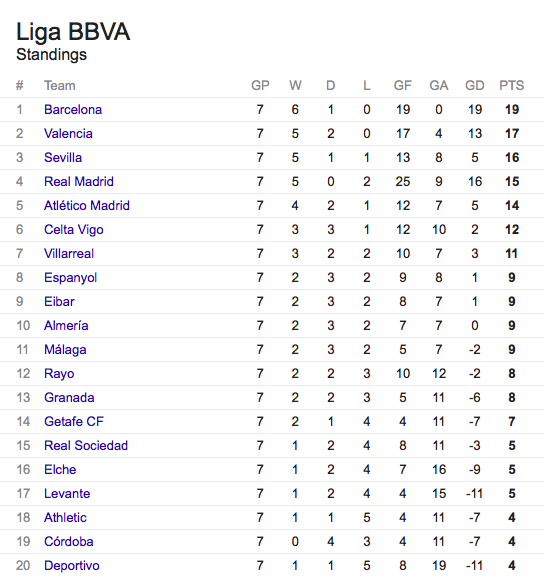 (I admit that this is slightly hyperbolic, but I am a Liga-stan.) And make one they did, as they raced out to a 3-0 lead after thirteen minutes. The usually solid Miranda was at fault for all three goals, scoring the first, losing Andre Gomes for the second, and failing to mark Nicolas Otamendi on a corner for the third. Atletico tried valiantly to fight back, scoring one off a Mario Mandzukic header, but this game was over when Diego Alves saved Siqueira’s weak penalty effort at the stroke of half time. The Brazilian has now saved 13 of the 31 penalties he’s faced, with only 15 getting into the back of the net. (The rest were either wide or off the crossbar.) Quite the statement game from Los Murciélagos, who are still missing Alvaro Negredo through injury. 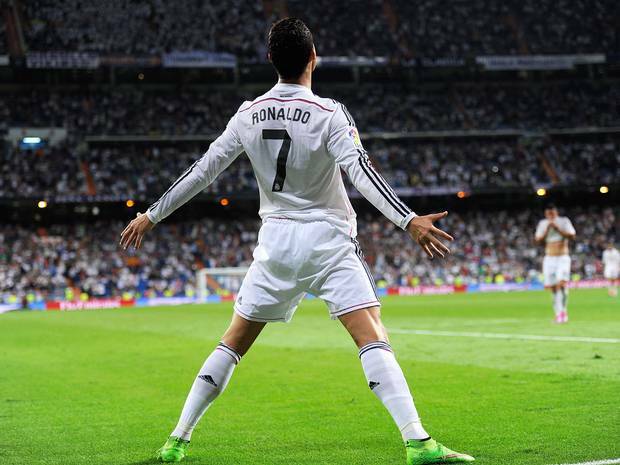 Real Madrid 5 – Athletic Club de Bilbao 0: Cristiano Ronaldo cannot stop scoring. The Portuguese forward added 3 more to his tally in the game at the Bernabeu, equalling the marks of both Real Madrid legend Alfredo di Stefano and former Bilbao player – and La Liga goal record holder – Telmo Zarra with 22 in his career with Los Blancos. Karim Benzema, who contrary to Real Madrid fans’ assertions does score, chipped in with two goals of his own while the other member of the BBC strike force added two assists. Barcelona 2 – Rayo Vallecano 0: Fresh off a Champions League loss to Paris Saint Germain, Barcelona headed to the Estadio de Vallecas with some question marks. It was after the game against Rayo last year that Tata Martino started facing questions (a game, I might add, that Barcelona won 4-0 but made the grave error of having less than 50% possession for the first time in five years), so this felt ominous. Luckily, Rayo Vallecano and Paco Jemez are one of the only teams left that try to play football with Barcelona. Jemez set his team up in a high line, and Barcelona gladly took advantage of it. After a tense 30 minutes full of offsides and defenders settling in to deal with the high forward press, a through ball over the line and into the path of Lionel Messi by Gerard Pique – who was left out of the lineup in Paris – opened up the scoring. Barcelona doubled up the lead less than 30 seconds of game time later, after a Marc Bartra pass found its way to Munir, who squared it up for Neymar to finish. It was 2-0 in less than a minute, and had Barcelona – particularly Messi – brought their shooting boots, it would have been worse. This entry was posted in La Liga and tagged Atlético Madrid, barcelona, cristiano ronaldo, La Liga, Rayo Vallecano, real madrid. Bookmark the permalink.